Growing up, monster cookies were my favorite type of cookies and I assumed everyone else loved them, too. It wasn’t until a couple years ago that I realized that lots of people have never even heard of these cookies! 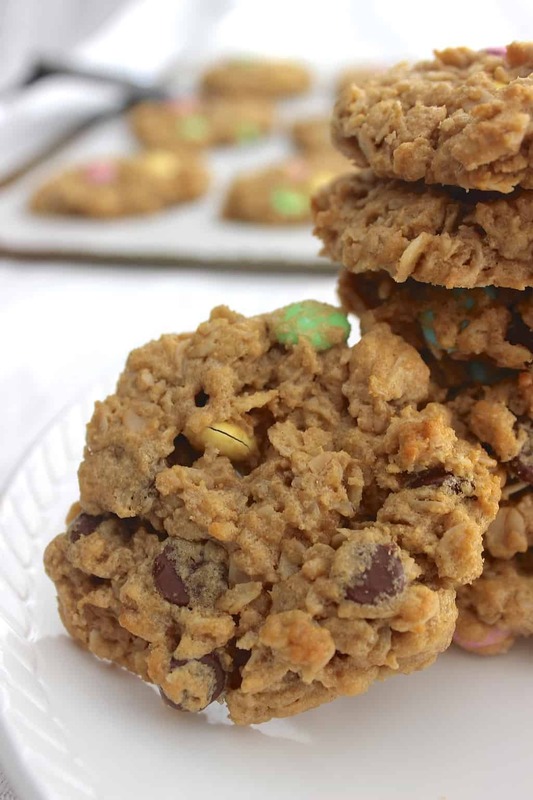 In case you’re not familiar with them, they’re soft, chewy peanut butter oatmeal cookies loaded with M&Ms and chocolate chips. I searched around and couldn’t figure out where the name originated…so let’s just say they’re Cookie Monster’s favorite cookies. 1. Since they’re absolutely LOADED with good stuff, they have something that just about everyone will like. They’re like chocolate and peanut butter “kitchen sink” cookies. 2. They’re really easy- you don’t even have to use a mixer! 3. Hands-down, monster cookie dough is the most delicious cookie dough there is. My mom and I can attest to this– when we made them last weekend, we both ate way too much of it! We used these fun pastel M&Ms, which are perfect for Easter or some type of shower, and we also use red and green M&Ms around Christmas time or pink, white, and red M&Ms for Valentine’s Day. So festive! 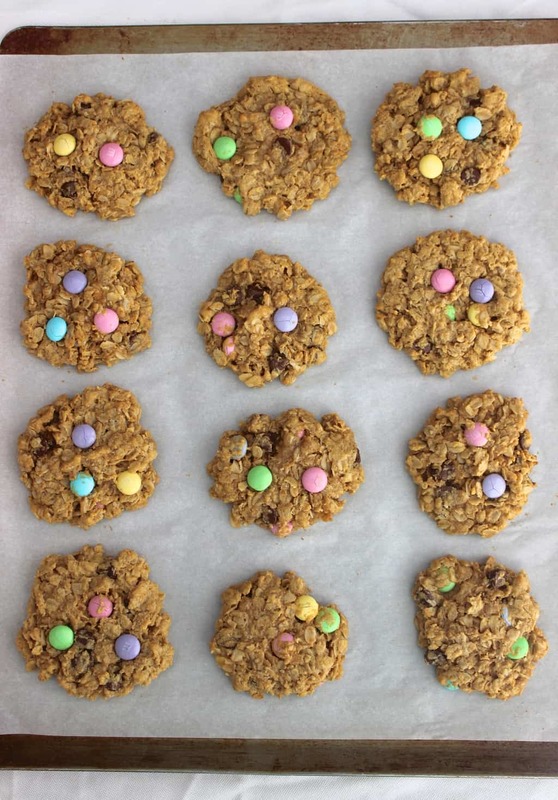 I’m not even a huge fan of M&Ms, but I always include them since everyone else loves them, and I’ll still happily (oh, so happily) eat these cookies any day. Sidenote: This isn’t necessarily a “healthy” recipe, but I firmly believe that a cookie or two can be part of a healthy lifestyle! Stir butter and both sugars together until creamy, or beat with a mixer. Add eggs, vanilla, baking soda and stir or beat with mixer. Stir in peanut butter. Add oatmeal, mixing until just blended, and then add chocolate chips and M&Ms. Refrigerate dough for 2-3 hours, or overnight, to firm slightly. (You can speed up the process by putting the dough in the freezer for 30 minutes). Form into tablespoon-sized balls and drop onto a greased cookie sheet or parchment paper/baking mat-lined cookie sheet. Flatten each dough ball with the back of a spatula before baking. Bake at 350 degrees for 9-11 minutes. For soft cookies, be sure not to over-bake them. Let cookies sit for 3-5 minutes before placing on wire cooling rack. Have you tried monster cookies? What was one of the first things you learned how to cook? Besides monster cookies, I think I learned how to make muffins, banana bread, and pancakes first. What are some nostalgic foods from your childhood? Do you still eat them? I ate bologna sandwiches with ketchup every day for lunch wayyyyy back in the day before our family started our health food kick. I loved them at the time, but I definitely don’t eat those still! 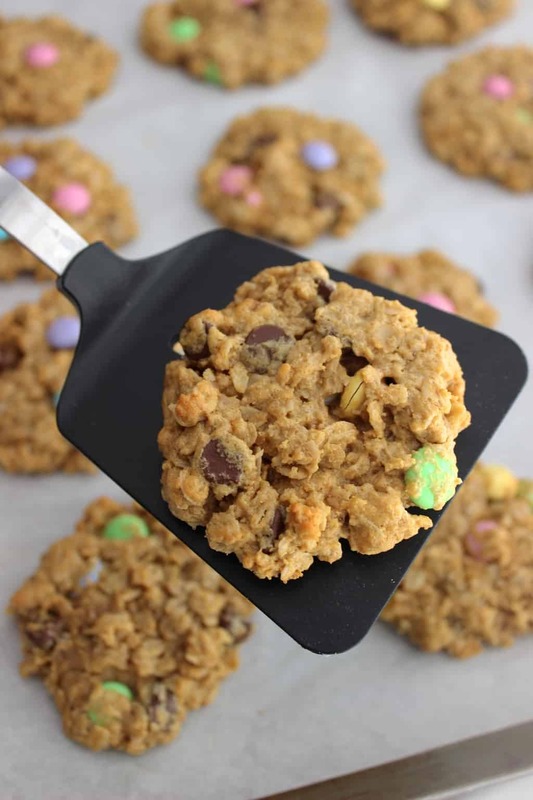 I have never heard of a monster cookie before, but I love those recipes where you just throw everything in. I’ve never had monster cookies before but peanut butter, oats, chocolate chips and M&M ain’t too shabby :). I love your idea of using different colored M&M to match different holidays, so cute. Thanks, Tjasa! I tried to comment on your Mediterranean bulgur salad recipe because it sounds SO good, but for some reason, it wouldn’t let me 🙁 I did pin it, though! I’ve also never heard of monster cookies… but I blame the fact that I hate chocolate (if I can use an excuse). But, I the base of these and have thought of 101 other things to put in them! Also, I just saw the link to your chocolate heath bars and now NEED to make them (skipping the chocolate, or using white instead). Thanks for sharing! I just recently heard of monster cookies and only knew that they had M&Ms in them. I had NO idea about the peanut butter! I will be saving this recipe for sure! I wouldn’t have touched any of the stuff I do now when I was younger. I was all about the Poptarts, toaster pastries, bagel bites, pizza lunchables, and dunkaroos haha. WOW! err… no! I’ve never heard anythig about Monster Cookies before but I PROMISE I’ll try them! They look so lovely and tasty! Thank you for the recipe! Anyway.. To answer your questions.. The first thing I learnt to cook was pizza! I’m Italian, of course is pizza! Haha. Anyway, pizza is quite easy to prepare.. Then I learnt to bake cookies with chocolate chips and different kind of pies.. The last thing I learnt (I’m still learning btw! :D) are “millefoglie” and “tiramisu”, 2 typical italian super delish cakes (I think you may know them.. check on the internet! ;P). As reguards foods that reminds me of childhood.. oh, there are so many! I remember vegan meatballs made by my granny, so tasty (I can’t make them as she does! ), salty pies and carrot/pumpking plum cakes and, of course spaghetti with basil, garlic and oil pesto, made by my dad. I still have this meals but I’m not as good as dad making this, although I’m quite a decent baker! I’m improving my abilities! Oh my goodness, I want you to teach me how to make pizza the Italian way! That could be a fun blog post to do? 😉 Mmmm, all of the foods from your childhood sound incredible! I love monster cookies!! YUM! 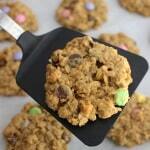 I just made a huge batch of Monster cookies for Brett my husband! I place them in baggies of four in the freezer and just take them out ever once in a while to thaw. I grew up making monster cookies in 5-gallon buckets so I wonder if the large amount of dough you make at once has anything to do with the name?! These look great! Ooh yes, I love freezing leftover cookies! They really do freeze and defrost perfectly. So interesting about the 5-gallon buckets– I’ve never made that huge of a batch but can definitely see how the name could come from that! Monster cookies are delicious, and yours look so festive! I love to cook and bake. Some of the first things I remember making are brownies, shrimp scampi, and stromboli. I’ve never made stromboli but that sounds like such a great thing to make. I used to LOVE Reese’s blizzards at DQ, too! I haven’t been there in a while, but the last few times, I’ve gotten the chocolate truffle blizzard, which is also really good. I’ve never tried making my own chicken tenders, but I’d love to try making them in the oven! I’m not a huge fan of fried food, so that would be awesome. I meaaaannnn, can I just make these right now?? Yum! These are so cute and easter-y! My mom makes a similar cookie to these and calls them cowboy cookies, the are soooo good! Those and wheat thins with string cheese definitely remind me of my childhood the most! Ahh string cheese totally reminds me of my childhood! I was obsessed with cheese cubes, too, haha. And I just looked up a recipe for cowboy cookies and they look so good! My favorite cookie to “make” when I was a little were those pre-scored tubes that had different shapes on them. (Once we burned an Easter batch, and the pink bunnies turned black. Oops.) I’m not a big M&M fan, but I think they would be a good cookie addition! I’ve actually never heard about monster cookies either. I have no idea why; those look delicious! 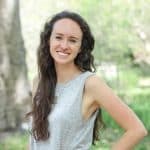 PS I’m so glad I stumbled on your blog! I live right up the road from you in Durham! If I’m going to have a cookie then I’m definitely going to want the real deal 🙂 These look great! My kids grew up eating monster cookies. The recipe I used made 4 times the amount of cookies. It was the same ingredients but 4 times the amounts yours lust. We also added pecan and coconut. I would put the raw cookies on wax paper and freeze them so that I could bake a fresh bash when ever they wanted then. So good. Pecan and coconut sound like awesome monster cookie additions! I’m dying to try them with coconut now. And I love freezing cookie dough balls to bake fresh- such a fun treat! !